The poster for last Saturday’s rally. See the end of post for the SPLC’s guide to the symbols. Who were those “very fine people” that President Trump chose to defend in his unhinged press conference Tuesday marching alongside in Charlottesville last Saturday? Jason Kessler, the organizer of the the Unite the Right rally, which culminated in the murder of counter protester Heather Heyer at the hands of a self-avowed Nazi, is a white nationalist blogger who bills himself as a journalist, activist, and author. He made his initial splash by trying to unseat Charlottesville only black city councilman. Richard Spencer is another white nationalist whose clean-cut appearance made him something of a media sensation when he first appeared around the fringes of the Trump presidential campaign. His goal is to create a white ethno-state in North America, a white homeland for European-Americans. A so-called “academic racist,” He dropped out of a PhD program at Duke in modern European intellectual history. Spencer has been connected to Trump White House policy adviser Stephen Miller. Christopher Cantwell is an alt-right anti-semitic shock jock who is the focal point of the disturbing Vice News documentary on the violence in Charlottesville. Watch and see for yourself the views that he espouses and which Trump tacitly defends if not outright supports. Matthew Heimbach is a white nationalist who graduated from Towson State University in 2013 with a degree in history, where he founded a campus chapter of Youth for Western Civilization and the White Students Union. He is considered emblematic of the new face of white nationalism in America. He is the training director for the neo-Confederate League of the South. Traditionalist Worker Party, a white nationalist group which blames Jews for most of the world’s ills and has close ties to neo-Nazi and other extreme racist organizations. Ku Klux Klan, the oldest of America’s hate groups. Vanguard America, the neo-Nazi organization with which Heather Heyer’s murderer was affiliated. League of the South, racist neo-Confederate separatists already mentioned above. Identity Evropa, white nationalists organizing on college campuses across the United States. Proud Boys, young white Trump supporters organized to be the street-brawling fight club fraternity of the alt-right. And providing “security” for all of the above, a variety of heavily armed Three Percenter and other antigovernment militia groups. So let me ask you the question that someone ought to ask President Trump: What kind of “very fine people” do you know who would have marched alongside this crowd? To decipher the symbols in the Unite the Right rally poster at the top of this post, I again turn to the SPLC. 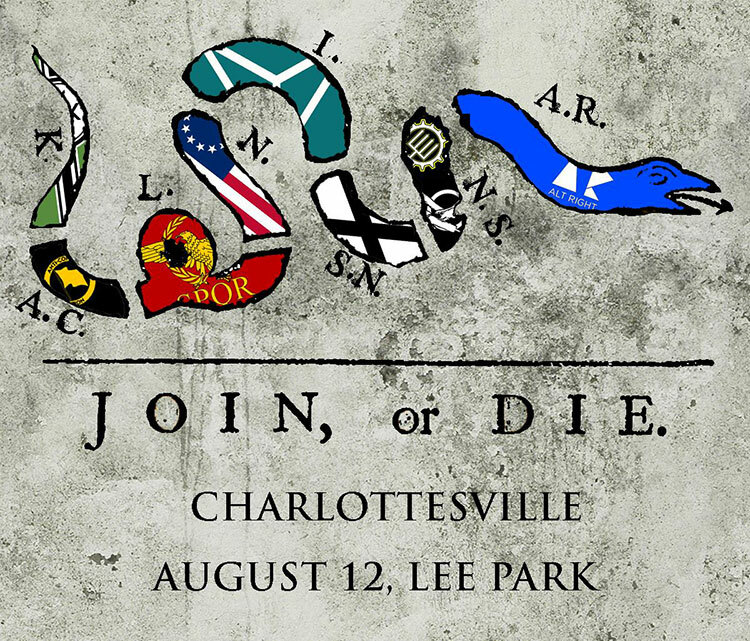 From left to right, the groups represented are: (K) “Kekistani,” (AC) “Anti-Communist,” (L) “Libertarian,” (N) “Nationalist,” (I) “Identitarian/Identity Evropa,” (SN) “Southern Nationalist,” (NS) “National Socialist,” and (AR) “Alt Right.” The National Socialist flags depicted include Traditionalist Worker Party and Vanguard America.